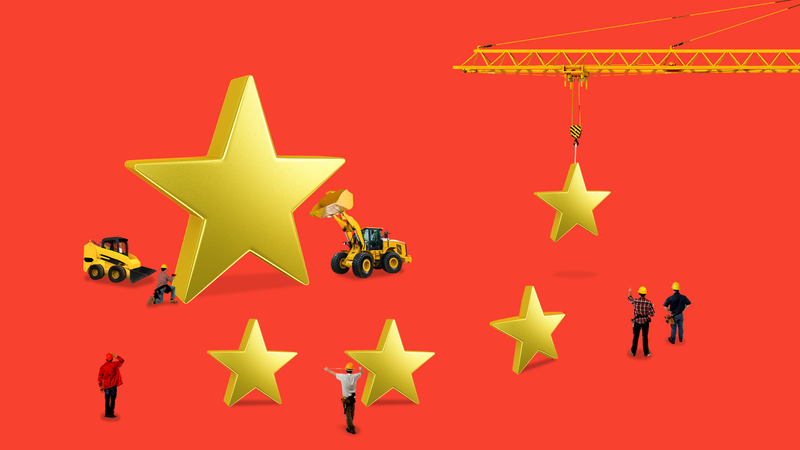 China was already building the largest single infrastructure project since the Marshall Plan — the Belt and Road Initiative, echoing planet-spanning 19th and 20th century moves by the British and then the United States to set the rules for global commerce. What's happening: But now Beijing is looking to amplify its reach far beyond what the U.K. and the U.S. accomplished in their respective heydays. A "digital Silk Road" that expands China's presence in cyberspace. The first global electricity grid, linking Asia, Africa and Europe. In terms of its capacity to project its will, Jonathan Hillman, of the Center for Strategic and International Studies, compares the grid plans to Russia's leveraging of its natural gas pipelines to intimidate Europe. "Chinese technology standards would effectively become global standards, benefitting Chinese companies and exposing nations reliant on that technology to security risks," Hillman tells Axios. And "if China becomes a significant exporter or central node in this global grid, that could enhance its coercive power." The background: Belt and Road is a slowly materializing network of ports, railroads, oil pipelines and other infrastructure across Asia, Africa, Latin America and reaching into Europe. It combines new projects and existing infrastructure, as the Chinese slap the Belt and Road label on almost any previously-built infrastructure along planned routes. Now the Chinese are talking about a companion project — a "digital Silk Road" in which countries would avail of Chinese AI, quantum computing, and cloud expertise. This digital highway would be "a community of common destiny in cyberspace," a vice minister of information technology told The Economist. Even more ambitious is the super-grid, which would rely on China's optimization of a technology called ultra-high-voltage (UHV) transmission, writes the FT's James Kynge. UHV can transport electricity along vast distances, from continent to continent, and that's what this super-grid would do — unite different regions in one electricity space, according to RWR Advisory, a consultancy firm. In an April talk at Harvard, Liu Zhenya, who runs the initiative, spoke of producing solar power in the Sahara and transmitting it to other, energy-starved continents. "I would say that a significant part of the motivation here is to find some modus vivendi for continuing with massive, high-risk and sometimes nonsensical (from a commercial point of view) power projects in foreign countries." As with Belt and Road there is no talk of U.S. participation in these projects: Quite apart from Beijing's own wishes, the U.S., not prepared to cede geopolitical ground, has held itself aloof and has been often openly hostile to Belt and Road. Be smart: But, should Beijing succeed in bringing in much of the world economy under its umbrella, the U.S. eventually risks growing economic isolation. China's grand infrastructure plan has spooked its rivals. How China trapped Sri Lanka under a mountain of debt. Malaysia reconsiders debt-busting Chinese projects. China’s debt-trap diplomacy is spreading across Africa. Chinese cash flows into Latin America. Get more stories like this by signing up for our twice-weekly robotics, AI and labor economics newsletter, Future.